Three methods for teaching critical thinking skills and smart media consumption habits to a generation growing up in a climate of information overload. Every teacher I've worked with over the last five years recalls two kinds of digital experiences with students. The first I think of as digital native moments, when a student uses a piece of technology with almost eerie intuitiveness. As digital natives, today's teens have grown up with these tools and have assimilated their logic. Young people just seem to understand when to click and drag or copy and paste, and how to move, merge and mix digital elements. The second I call digital naiveté moments, when a student trusts a source of information that is obviously unreliable. Even though they know how easy it is to create and distribute information online, many young people believe -- sometimes passionately -- the most dubious rumors, tempting hoaxes (including convincingly staged encounters designed to look raw and unplanned) and implausible theories. How can these coexist? How can students be so technologically savvy while also displaying their lack of basic skills for navigating the digital world? Understanding this extends beyond customary generational finger wagging. While it's tempting to blame students themselves for failing to think critically, we should remember that the digital revolution represents one of the most radical changes in human history. Students today face a greater challenge in evaluating information than their parents or grandparents did at their age. The cumulative amount of information that exists on the planet, from the beginning of recorded history to the present, is, by realistic estimates, doubling every two years. And even though digital natives have grown up in the information age, many of the adults and institutions in their lives are still grappling with its implications. In other words, it's likely that the kind of credulity we see in young people reflects our own collective uncertainty about what we encounter on the digital frontier. Finally, the skills that students need to effectively sort fact from fiction are often missing from school curricula. This isn't to suggest any shortcoming on the part of today's teachers. 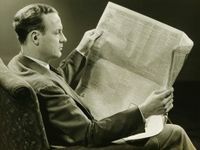 Without the classroom time, quality teaching materials and professional development opportunities in the emerging field of news literacy, teachers cannot reasonably be expected to guide their students to achieve these new skills. News literacy is a relatively new field in media studies that focuses on defining and teaching the skills that citizens need to evaluate the credibility of the information they encounter, and on examining the role that credible information plays in a representative democracy. It's also a subject that most students find inherently engaging and relevant. In fact, a recent study found that 84 percent of young people between the ages of 15 and 25 say they would benefit from learning these skills. But the question for teachers remains: "How can I integrate news literacy into my classroom amid so many other priorities, standards and goals?" I'd like to share three accessible ideas for how to do so. Then have each team lead an assessment of its assigned attribute. Consider writing a group letter to the reporter, creator or editor about items that are either exemplary or problematic. Pose an "essential question for the day" that explores the power and impact of information (e.g., "What changes would we see in the U.S. if the First Amendment protections of speech and press were repealed?"). Then use such websites as the Committee to Protect Journalists or Reporters Without Borders to examine press freedoms around the world. Track the number of journalists jailed, kidnapped or killed in 2014, and investigate the circumstances surrounding these incidents. Display a different example of dubious information each week or month and challenge your students to research its accuracy using non-partisan fact-checking resources and advanced web searching. Give prizes or extra credit to those who get it right, or work collaboratively to seek answers as a class. Not only can these ideas be adapted to explore a range of relevant issues in a variety of academic subjects and grade levels, they also embody the principles of 21st century learning and are aligned with Common Core State Standards. News literacy education has the potential to engage students and ignite their critical thinking. More importantly, it can empower them to make better-informed choices in their lives as they move beyond the classroom and into the world. For more information about the News Literacy Project, including our free online professional development session this spring, visit our website.